Hair: Black, straight and long, reaching to about the waist. She wears a jagged, yellow headband. Life history: Venka is Kahvi's second daughter, having been sired by Rayek. For quite a while Rayek wasn't aware of her existence, however, as Kahvi had told him that the child she had borne had been pale and blue-eyed, and had died at that. She had told this lie because she had wanted Rayek's child, but not his influence on it. She wanted his blood running in her tribe, raised the Go-Back way. Rayek didn't trust her story entirely, but didn't press on. Kahvi's plans with Venka were ill-fated almost from the start. Rayek had left for Blue Mountain, and came back with the power of all the dead Gliders in him. He discovered that Ekuar, whom he had entrusted to the Go-Back's care, had been captured by the trolls. In his outrage at this, combined with the delayed outrage that Kahvi could have been so cold and detached about a dead child that could have been his, he destroyed the Go-Back lodge, thereby almost killing his daughter and Kahvi. Kahvi had managed to take cover in an underground storeroom with the child, however, and both survived. 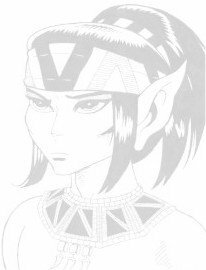 Kahvi was now intent on getting revenge for what Rayek had done to her and the Go-Backs (which was banning the tribe and taking the Palace away), and started her pursuit on him. She tracked him first to the Wolfrider's holt, found it deserted except for Aroree and went with her to Sorrow's End, only to find that Rayek wasn't there anymore either. Kahvi and Aroree then followed the trail across the Vastdeep Water, meeting Tyldak along the way, and ended up with the Wolfriders, to discover that Rayek wasn't even there either, as he had taken the Palace into the future, so they were now basically stranded there. At the time, Venka was probably about a year old, but she had already shown that she had exceptional powers: while crossing the Vastdeep Water the four elves were more or less mind-snared by Winnowill, who lurked in the water, and they would have drowned if Venka hadn't brushed Winnowill's sending off. The total string of events meant that Venka grew up with the Wolfriders, together with Tyleet, who was born some two years after Venka. Kahvi stayed with the Wolfriders until her daughter was grown up (and then some), teaching her things about the Go-Backs and initially intending that Venka be the tool of her revenge on Rayek. Over the years her need for revenge became less strong, however, and eventually she only asked Venka to teach Rayek a lesson, after which she left the Wolfriders together with Tyldak. The Wolfriders finished Venka's upbringing, something which did her well. Venka is a calm, stable woman, totally certain of herself and fully aware of what her capabilities and limitations are. She is a perfect balance of her father and mother, combining the best of both of them. After five hundred years with the Wolfriders she chose to join them in wrapsleep to await the return of the Palace. When the Palace returned, Venka met up with her father for the first time. She knew that he intended to prevent the High Ones' accident, thereby wiping out anyone who wasn't inside the Palace at the time, and knew that she was raised to prevent him from doing so, something which she was capable of. Her years with the Wolfriders, however, had not taught her to hate, and she did what she had to do: let Rayek decide for himself. Before they got to that, however, there was the matter of Winnowill to resolve. Rayek had wanted Leetah to heal Winnowill, but the former refused and the latter resisted. Winnowill threw them away from her with a surge of water and then wanted to kill anyone left in the Palace so there would be no tainted beings in the Palace. Venka and Rayek stopped her together, with Venka putting Winnowill in some sort of suspended animation. After this she devoted her attention to Rayek, who eventually refrained from merging the Palaces. The next six years were spent with Rayek attempting to regain his powers, and Venka visiting him often and establishing a father-daughter relationship with him. She knew he had made mistakes, but accepted him as he was and always supported him. After these six years Rayek regained his powers and flew the Palace to Sorrow's End and back, and then had his fight with Cutter to clear the air between them. During the celebration of the succes of this, Winnowill regained her senses and tried to fly off with the Palace. Rayek and Venka realised what was going on, and together they tried to stop her. Initially this failed, as Winnowill's already impressive powers were amplified by the Palace, but Venka eventually managed to sever the contact between Winnowill and the Palace, after which it plummeted down and crashed into thousands of pieces. This initiated the Shards war with Grohmul Djun, as this human warlord had his people gather up every single one of the pieces. Venka stayed with Cutter's half of the tribe and helped recover one half of the Scroll of Colours, but she fell into the Citadel. She was wounded, but Two-Edge found her and nursed her back to health, after which he claimed to each and anyone (especially the Djun himself) that she was his maiden, protecting her from all harm. After the war, with Winnowill dead and her spirit trapped inside Rayek, Venka was no longer needed to protect the Wolfriders from her black sendings, and she left together with Aroree and Two-Edge to search for her mother Kahvi.